Teambuilding in the VGC 2017 format can be a tough job. In a limited format with roughly 270 Pokemon available for use in total, it can be difficult, especially when you realize that a Pokémon that can perfectly fit your team isn't available. This guide will attempt to help you understand this format much better and even build strong teams that can challenge the metagame. Hope you enjoy and let's begin. Now it's time to start with my actual team building strategy that I use with all of my teams. Every good team that has found success in VGC started with a strong foundation, or an idea that the player wanted to build off of. Whether its a switching the core from the VGC 2016 metagame that was used by Wolfe Glick, Markus Stadter, Baris Akcos, and Brendan Zheng at the 2016 World Championships of Raichu's Volt Switch in combination with Hitmontop's Eject Button to protect Kyogre, or the offensive core from the VGC 2015 metagame that saw success in the online Japan Cup of Tyranitar + Excadrill + Mega Salamence that was popularized by Aaron Zheng who replaced the Excadrill with Landorus-Incarnate at the 2015 US National Championships, each team that has had great success in VGC is built off a core. In the VGC 2017 metagame is built off a strong core. In this guide, we'll start off a strong foundation of Arcanine + Tapu Fini + Kartana, which I have covered in this article to show how this works. Once you establish a foundation, the next step is to add the support for the team. This means that by identifying what your team is currently struggling against and find a Pokemon that can help resolve the problem. This can be either 1 Pokemon that fills the role you need it to, or multiple Pokemon that can fix your issue. Remember that whichever Pokemon you add needs to be able to mesh well with the team and be able to support where they fail. Because the team is on the faster end and Trick Room may prove to be a problem, Snorlax will prove to be a great member as its bulk, offense, and overall usefulness is very nice. This is essentially a continuation of Step 2. All this step means is to continue to look at what your team struggles with and to add Pokemon that can help your team out. Look at your team and see what it struggles with, whether it'd be a certain Pokemon, move, or strategy that your team can struggle with. I'll link a pastebin here that shows a team I built in the 2016 format that works off this team building strategy and was actually one. The final 2 Pokemon that we'll add is Garchomp and Muk as Garchomp gives us a faster Pokemon and a strong user of the Earthquake move, while Muk can give us use of strong Poison moves to handle the Tapu Pokemon, which is valuable. Now that you have a team of 6, the next step is to starting testing it. Resources like Pokemon Showdown and the Battle Spot on cartridge are great as it allows you to test your team against other people and see what it struggles with. Pokemon Showdown is great to get 4-5 battles in roughly 20 minutes while Battle Spot gives you a better representation of the current metagame and higher on the online ladder in Battle Spot, you might even get matched up against top players from around the world, though Pokemon Showdown has that perk too. Either way, these 2 are great ways to use to gain more experience with your team. Now I wanna show a team checklist that its good to keep in mind, but isn't the end all, be all for every team. How fast is my team? Can I afford using faster/slower Pokemon? Are my Pokemon too frail? Can my frailer ones make an impact? Are they too bulky with no offensive pressure? Do I have good overall typing? Can I switch easily between members? Am I really weak to 1 type/move? Does my team have at least 1 check to every Pokemon? Can I win against strategies such as Trick Room, weather, and Tailwind? Here's some resources that I recommend using. I'll link a forum post here from Trainer Tower that was collected by Mindape and posted by Jiwa since its a very long post and would probably be as long as this article by itself. EV Spreads are key to allowing your Pokemon to perform their role. An offensive Pokemon will enjoy their EVs placed in Attack, Sp. Attack, and Speed, while defensive Pokemon may place their EVs in Defense and Sp. Defense, or some Pokemon may invest in multiple stats to play a bulky support role with offensive potential. Also, sometimes, a 4/252/252 EV Spread is just fine for certain Pokemon. For long tournaments, its important to remember that you'll be playing for a very long day, multiple people, and many different Pokemon so its important to make sure your Pokemon are trained in a way that allows them to handle various situations. I'll link 2 articles here and here that were written by DaWoblefet, a very talented player that goes into how to make great EV Spreads. I've learned from them and its very helpful. Linked here, you can also learn the best places to train certain stats in the Alola Region. 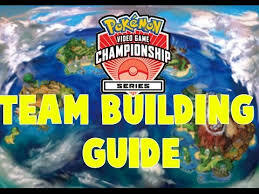 While team building in VGC is a very hard topic to accurately cover as there is many topics to talk about, but I hope that this article can help you understand it better. I tried my best to accurately cover them, and provide links for a better understanding on them. I hope you enjoyed this article and check out my older content and I'll see you guys next time. Bye!